Pacific storms pummeled the Cascade and Sierra Mountains over the weekend. Snow refreshed the slopes and allowed more lifts to crank into action. Skiers and riders whooped it up as some resorts saw overnight snowfalls pile higher than boot tops while off groomed runs blew into face shots. It’s a whole different story this winter for the West Coast. So much snow fell over the course of several days that Mt. Baker sailed passed the 100-inch mark, the first ski resort in the country to do so. In a few places, high winds, heavy snowfall and power outages compounded operations, sometimes delaying lifts for avalanche control. In Washington, ski resorts are already seeing better snow than last year’s bleak winter, when the Summit at Snoqualmie opened for only 44 days. A warming spike pelted rain across Cascade resorts midweek wiping away some of the snowpack, but they quickly rebounded as temperatures sunk cooler and snow dumped late in the week. By Sunday morning, Dec. 13, Mt. 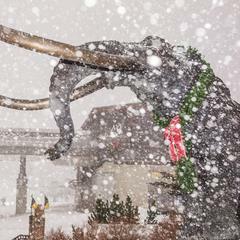 Baker recorded 17 inches of snowfall in 24 hours. That snow mounded the base on Pan Dome to 110 inches, the deepest snowpack in the U.S. Most other resorts lag behind by 30-60 inches. Despite temporary high elevation closures for avalanche control and high winds, many resorts were able to add more lifts on to their operations. Skiers packed out parking lots at Crystal Mountain, Stevens Pass, Mission Ridge, 49 Degrees North, Summit at Snoqualmie and Mt. Spokane. “First time up this year, and today (12/13/15) was better than any day I went up last year (what a surprise). 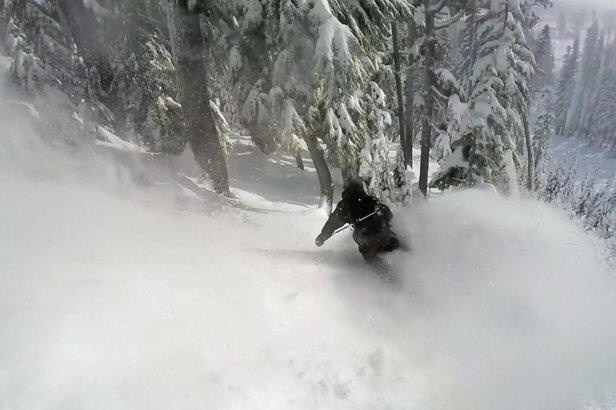 Lots of powder pockets off of the trails, and on the trails there was an inch to two inches of powder over packed powder,” one firsthand report recorded on OnTheSnow. In the deluge of rain that saturated the Cascade Mountains midweek, U.S. Highway 12 over White Pass suffered three major washouts and a landslide. The washouts stripped off most of the eastbound lanes, and the damage closed the highway on both sides of White Pass Ski Area. Although the resort is amassing snow for good skiing, it will remain closed until Washington Department of Transportation makes repairs. 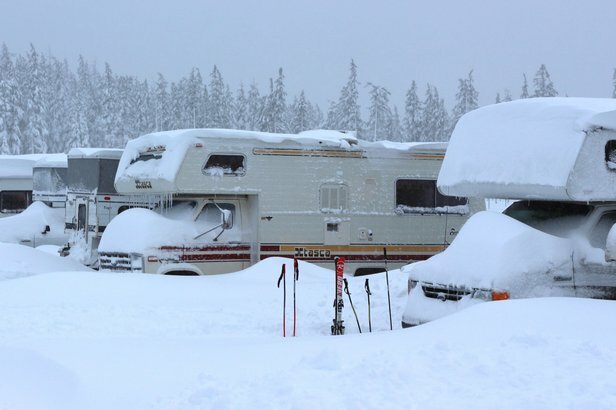 In Oregon, while snow piled around RVs that resort employees jokingly call “slopeside lodging” at the base of Mt. Bachelor, their occupants woke on Sunday morning to 20 inches of snow in 24 hours. 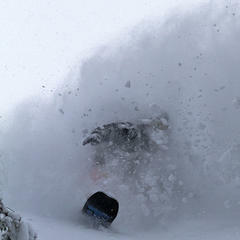 “Face shot quality snow,” reported Dr. Fun on firsthand reports. Snow accumulated at Mt. Hood, Timberline Lodge and Mt. Hood Meadows. Mt. Hood Ski Bowl operated their tubing hill, but still needs more snow to run lifts. 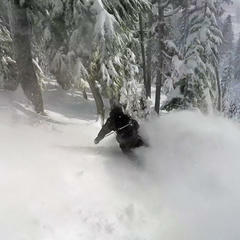 “First day of this season was better than any day last season,” said one firsthand report from Mt. Hood Meadows at the front end of the storm. By the time Monday morning, Dec. 14, rolled around, Meadows had piled up 54 inches of new snow in five days and launched its 7-day-per-week operations. Anthony Lakes and Mt. Ashland also ran lifts. “Better snow top to bottom than any time last year,” noted one firsthand report from Mt. Ashland. In California, the snow delivered a reverse of the past four years. 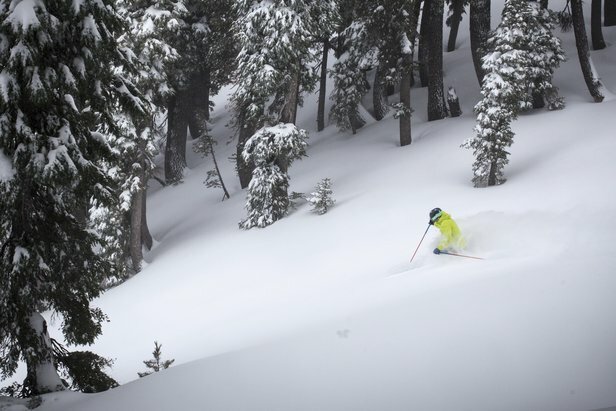 By Friday morning, Dec. 11, many of the California resorts woke to powder days with most picking up 1-2 feet of snow overnight. Some upper lifts opened late due to hefty avalanche control work and high winds, but when they did, it was a heyday for skiers and riders. 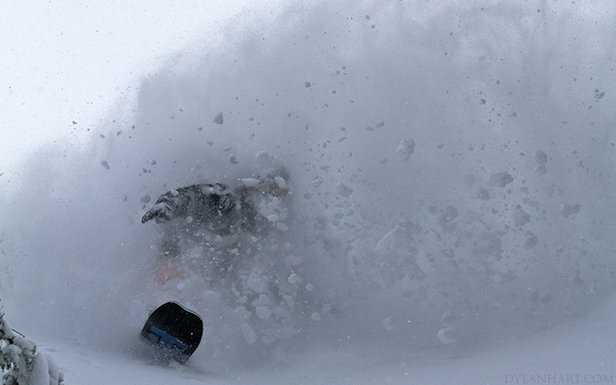 “Best conditions in years,” quipped one firsthand report from Mammoth Mountain. On Sunday, Dec. 13, storms came with high winds, forcing temporary closures of Northstar, Sugar Bowl and Sierra-at-Tahoe. Then, another storm wave brought a repeat of snowfall 1- to 2-feet deep on Monday morning, Dec. 14, to the Lake Tahoe resorts. 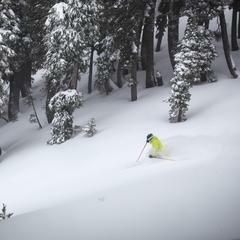 Lake Tahoe area resorts—Sugar Bowl, Boreal, Squaw Valley-Alpine Meadows, Kirkwood, Heavenly, Homewood, Diamond Peak, Dodge Ridge, Northstar, Sierra-at-Tahoe, Donner Ski Ranch and Mt. Rose—all nabbed powder days. Mammoth Mountain expanded operations to Eagle and Canyon lodges. June Mountain and Badger Pass opened for the season. One firsthand report from Kirkwood summed it all up in two words: “Pow pow.” And there's more on the way. Visitors' Choice Awards Survey: What's Your Favorite Ski Resort? Cast your vote for best ski resort now and determine our Visitors' Choice Awards 2016 winners!